Quebecor-owned TVA Sports appears to be going against the regulator's rules. The start of the NHL playoffs has seen a particularly strange carriage dispute in the Canadian province of Quebec. On Wednesday at 7 p.m. Eastern, just ahead of the start of the first playoff game (between the Columbus Blue Jackets and the Tampa Bay Lightning), French-language TVA Sports went dark on Bell’s satellite service. 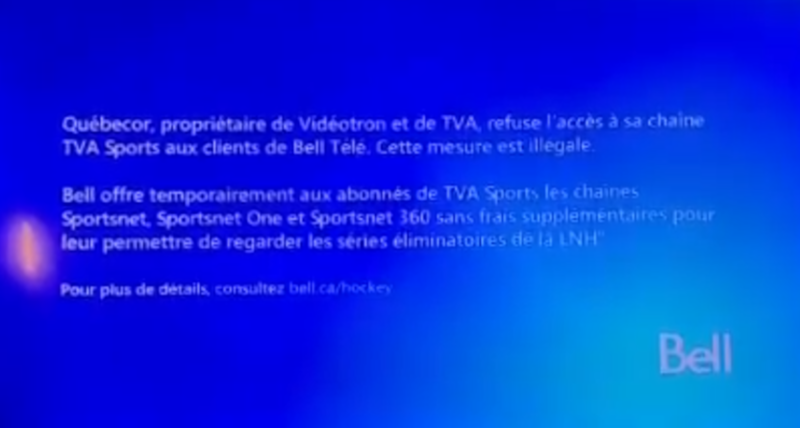 Bell requested and the Canadian Radio-television and Telecommunications Commission (CRTC) today issued a directive requiring Quebecor to continue to provide TVA Sports to Bell TV and its customers. “Bell will continue to negotiate with Quebecor in good faith as we always have and we look forward to a fair resolution. Our focus is always on delivering for the fans, and that’s why RDS is #1,” said Ms. Turcotte. We’ll see how this one turns out, but deliberately doing what a regulator appears to have told you not to is a bold strategy, Cotton.